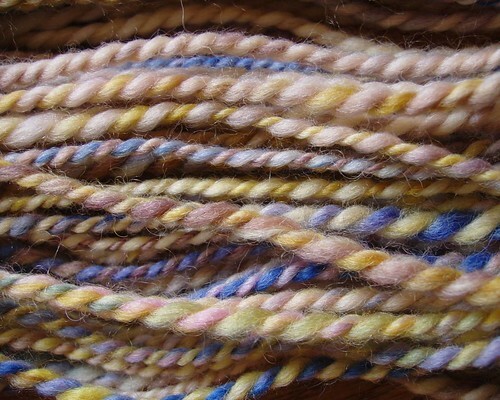 One thing I’ve always said about fiber arts is that you can’t get bored since there are so many different things to do with fiber. But I must be in a rut because I am getting bored. When I first embarked on this journey, I was much more adventurous and experimental. 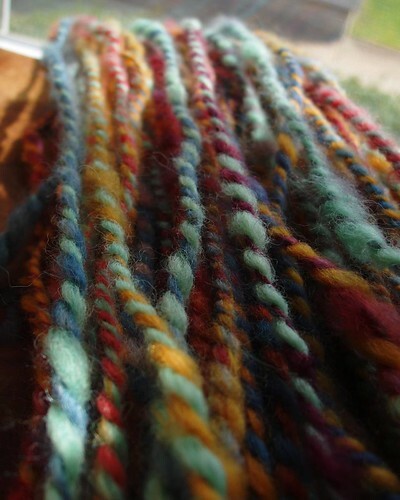 These days I just pull out another braid of top or roving from the stash, spin it like always, and move on to the next one. I know there are so many ways to spin and so many techniques to try and I need to start exploring them before I go completely mad! Recently I got back to spinning from the fold. The first time I saw someone do this, I was mesmerized and intimidated. 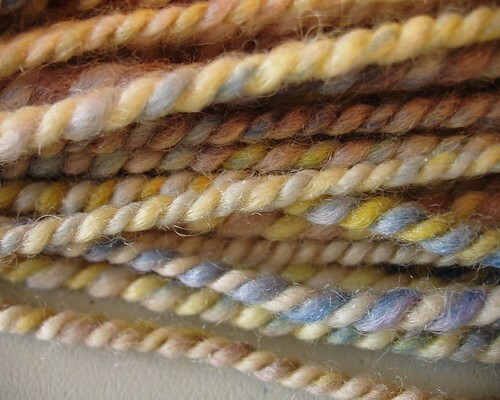 Now I find it enjoyable, although sometimes it seems that I am spinning from “the mass” instead of “the fold”, as the fiber can get a little out of whack and messy. 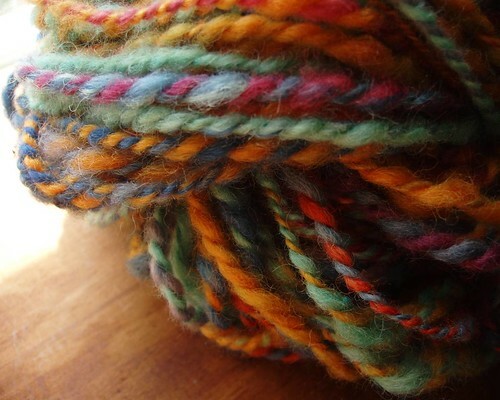 I like it because my yarn has more loft and a bit of a hairy/fuzzy quality plus I get the occasional tuft for character. 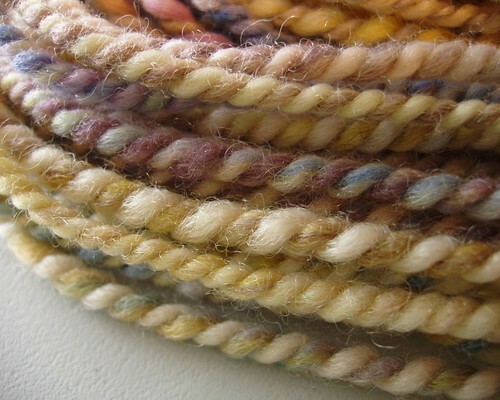 The yarn below is Bluefaced Leicester and started as 4-5 different balls of dyed roving. I would work between two or three colors at a time, then switch to a different group of colors. Because I was spinning from the fold, I pulled the roving apart into pieces the length of the staple. I folded the piece over my index finger and pulled back to draft. I probably don’t do it exactly right, but I like it better than that inch worm thing you see all the time with top. Lofty and fuzzy! 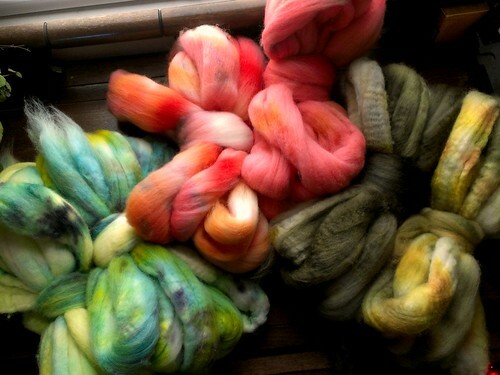 "Gypsy" Handdyed BFL, bulky weight. 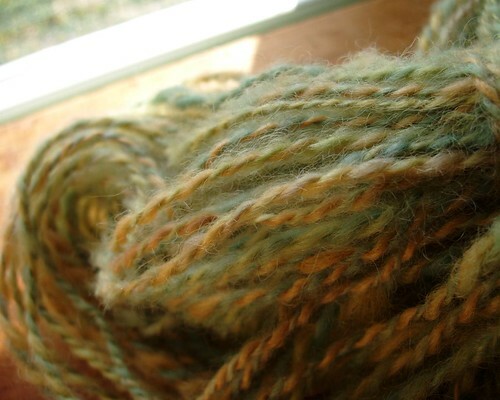 This one began as handdyed Lincoln roving and was also spun from the fold. It didn’t get quite as thick ‘n thin as the BFL, but it is hairy and lofty. 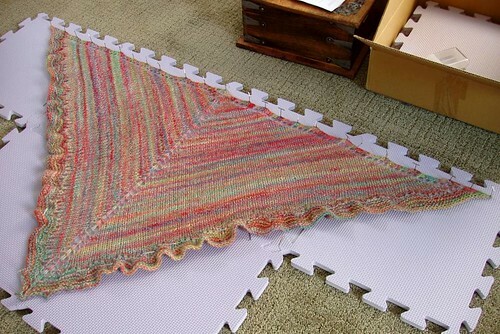 Probably going to end up heavy worsted weight. 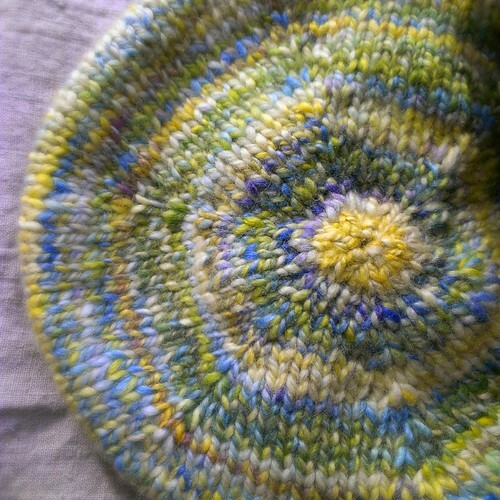 I suppose this makes Part 3 of my unintentional series on Finishing Fibers. 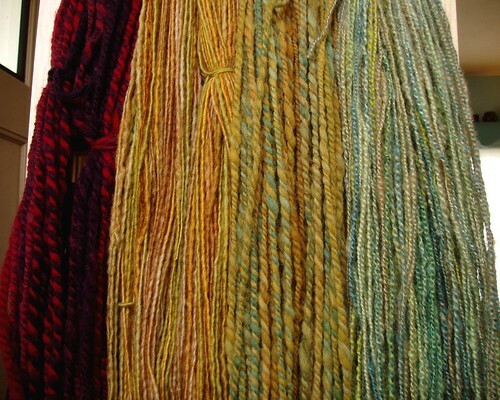 Earlier I wrote about reskeining your yarn after you have washed it and then I gave a lengthy description of how I wash my skeins. 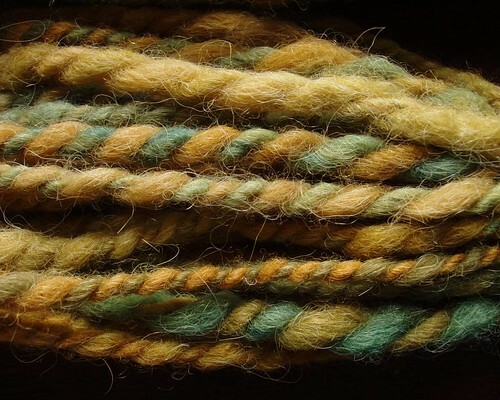 Today I’m going to show you the difference washing a skein can make. 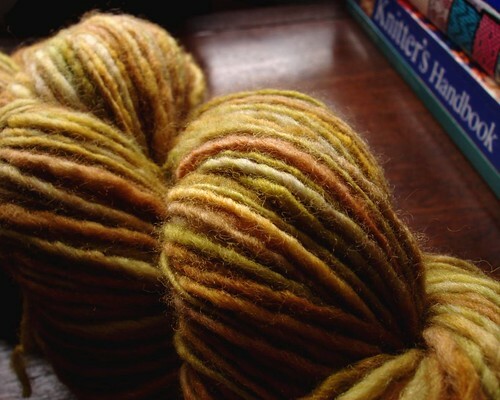 I purposely took photos of a skein before and after washing it. 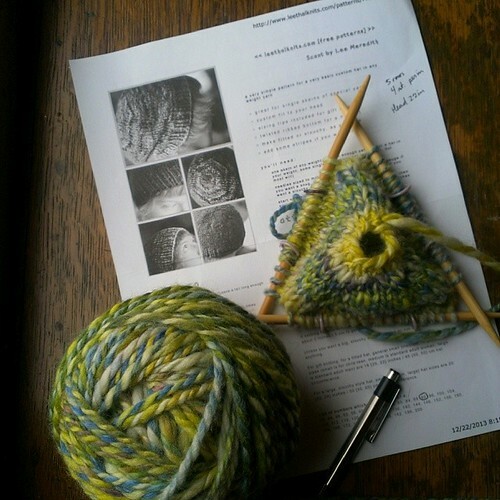 This 2-ply yarn is 100% Bluefaced Leicester wool, spun on my Kromski Sonata. I washed it using my standard methods as noted in the above post. Can you see the differences? I think the plies lay together more evenly after washing. They have more fluff and bounce. 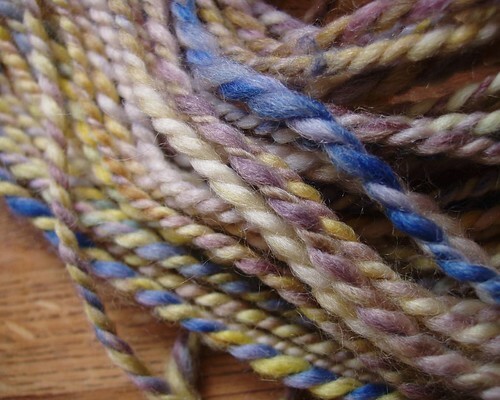 The skein appears more balanced, even though it may not have been initially. 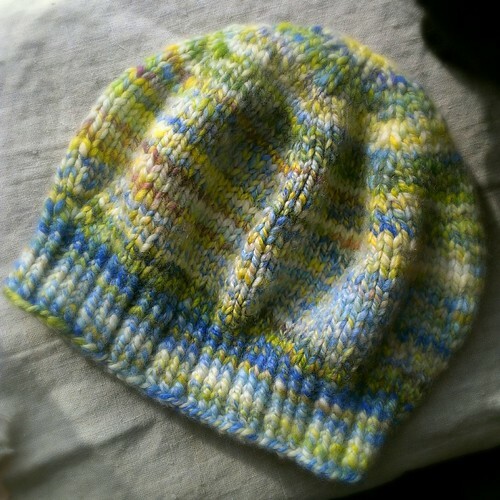 So, have I finally proven to you that finishing your yarn can make a difference? 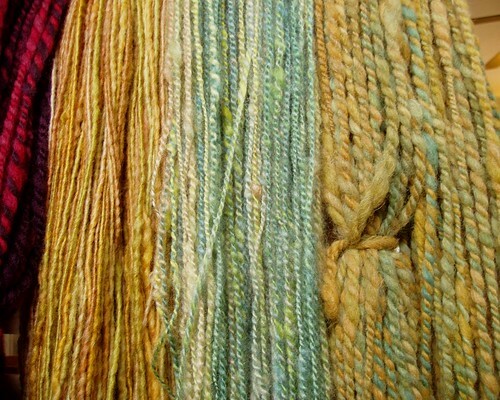 Next time you are washing skeins, take note of the before and after. It may be subtle, but it is a transformation! And you can check out the latest issue of my newsletter. If you aren’t receiving it in your mailbox, sign up here to get it. 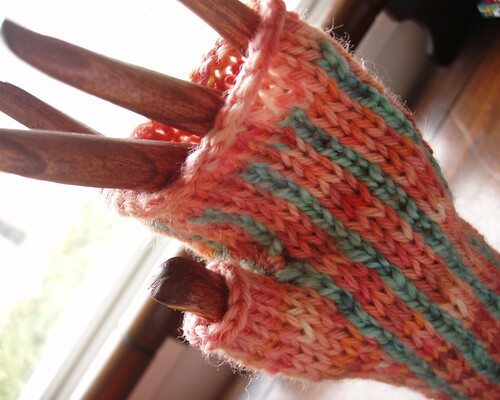 A-M-M = Always making mittens. Or at least I should be. I’m finding it a challenge to maintain my 40 hours of real work and continue to forge ahead with my own business. 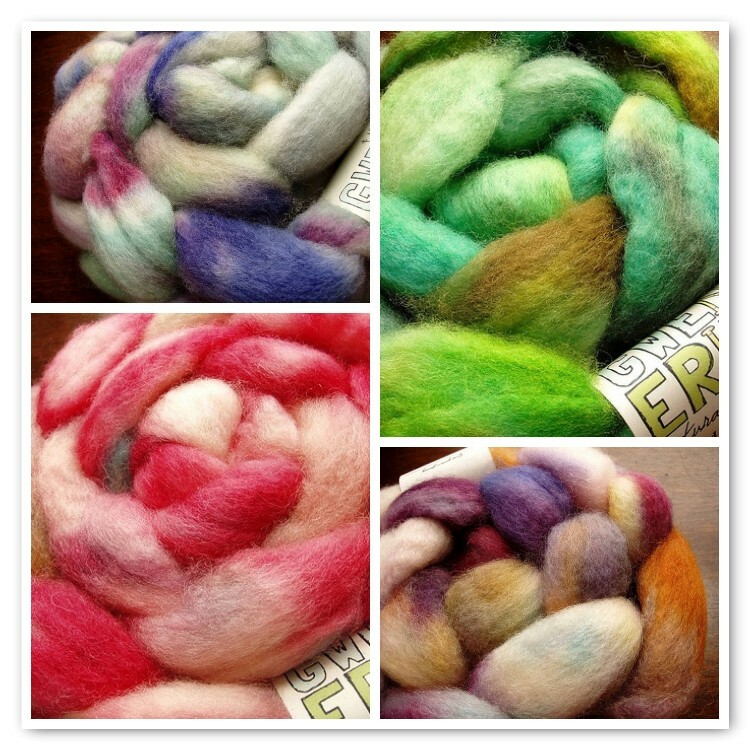 I am trying to get out there more – I created a Facebook page for Gwen Erin Natural Fibers, so feel free to pop over and “like” it, or whatever they’re calling it these days. I’ve also decided that whatever items are listed on Etsy won’t go to shows. That way I don’t have to close the shop for every show and make sure to remove items that sell afterward. One less thing to stress over. My mom found this lovely wooden hand model for me when she was down in Florida. It’s great for taking photos – much easier than trying to take a picture of my own hand. 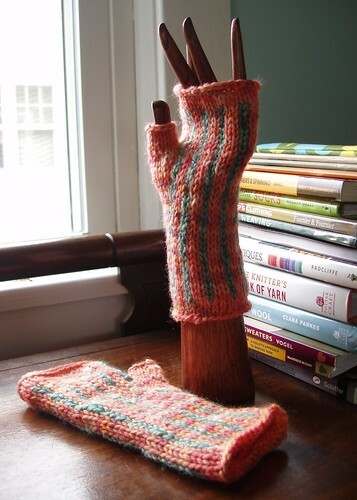 It’s wearing my latest pair of fingerless mittens. 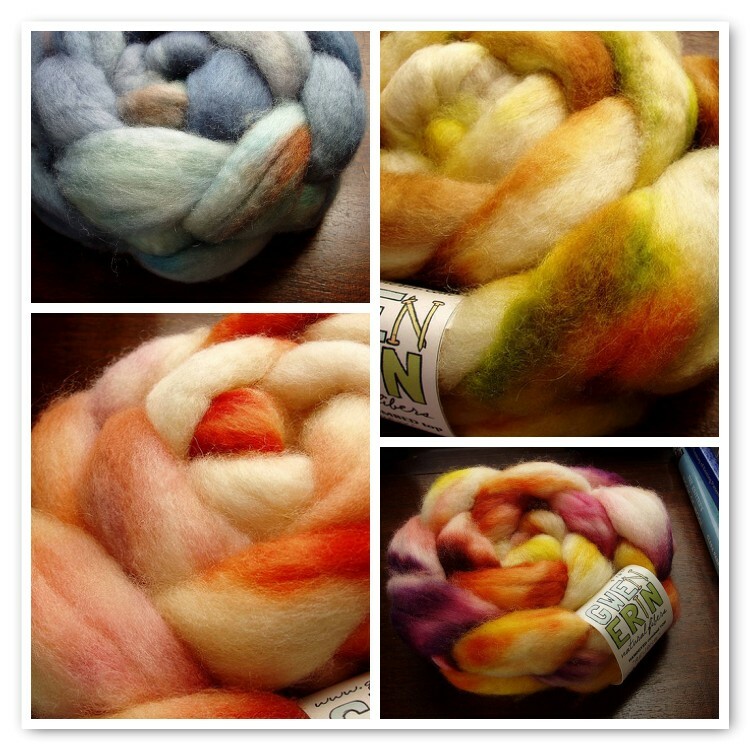 Contents include handdyed commercial wool and handdyed/handspun BFL. 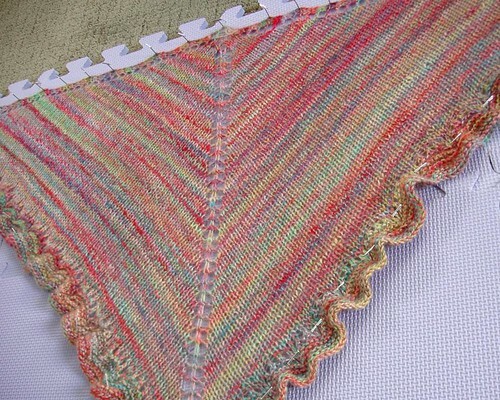 I tried three different stitch patterns before settling into these vertical stripes. All that stranding certainly makes them very thick and warm.